Learning English: don't forget to dot your i's and cross your t's! 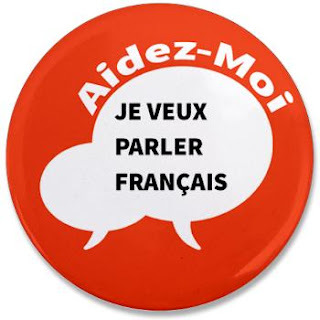 Learning French: don't forget to dot, diaeresis or circumflex your i's, grave accent or circumflex your a's, grave accent, acute accent, cedilla your c's, diaeresis or circumflex your e's, circumflex your o's, grave accent or circumflex your u's and cross your t's ! Oh mon dieu!!! That quote above, courtesy of website you had me at e flat major, is a simplified comparison, but it often reminds me of the crazy road I have been on since jJ'ai étudie le français! J'ai fini le cour français part deux (2) a l'université de Toronto, et j'ai continué avec le cours français - part trois (3)! What can I say other than what started out as an adventure to expend my linguistic knowledge has become an intense, tough but sorely needed wakeup call to what I thought would be a casual walk down a french lane. I will admit that it truly feels good to head back to school to (re)learn French, but it turns out the early years (nee Elementary and High School) of my French education were complete turned on its head. Regurgitating verbs and pronouns and adjectives you thought you would never have to see again has not been a joy. The upside though, is that amazingly, I have gotten a bit better. So now when my professor starts speaking to us in rapid-fire French, I am actually understanding her (albeit leaving class with a slight headache from having to completely concentrate)! All of this just proves "Oui, vous pouvez enseigner à un vieux chien de nouvelles astuces!" (you can teach an old dog new tricks!